This blog post is brought to you by the letters I, M, N.
As in, I M N the 2016 Boston Marathon. Guilty of speeding. 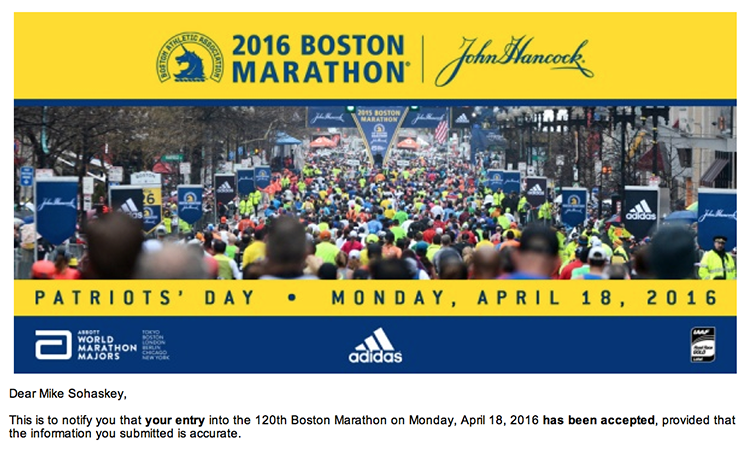 Meaning that next April 18, I’ll be fighting back imposter syndrome while lining up alongside some of the world’s most fleet-footed runners at the 120th Boston Marathon. The most prestigious marathon on the planet will also be my fourth World Marathon Major, after Chicago in 2012, Berlin in 2014 and New York City in 2014. But even with a qualifying buffer of 2 minutes 53 seconds, getting in was never a sure thing – the BAA’s cutoff for acceptance this year was the most severe in the race’s history at 2 minutes 28 seconds faster than the official qualifying times (don’t know what I’m talking about? Read all about it HERE). So my qualifying time of 3:22:07 means I squeaked in with all of 25 seconds to spare. A shocking 16% of applicants – all of whom had met the BAA’s official qualifying standards – weren’t so lucky, including one of my own running buddies. His 2015 Boston finish time, which at the time seemed like a can’t-miss return ticket, left him out of the 2016 field by two seconds. If I’d run one second per mile slower at Mountains 2 Beach, I’d be staying home next April as well. But 25 seconds or 2500, I’ll take it and (literally) run with it, because I know how much work & how many miles went into this. And because to my mind Boston is the pinnacle of competitive – or in my case self-competitive – racing. I could cross 100, 200, 500+ finish lines over the course of my life, and with luck maybe I will. But I know myself well, and if I’m honest I know that only the blue & gold unicorn will ever make my medals rack feel complete. Silly as it may sound, I can’t rationalize my way around it. You can’t fake Boston – unless of course you’re Kip Litton or Mike Rossi. So I’m already counting down the ticks and tocks to 10:00am EST on Patriots’ Day, hopefully followed the next week by a return to Big Sur for the Boston 2 Big Sur Challenge. In fact, next year’s race schedule is already taking shape – and for good reason. Qualifying for Boston 2017 has already begun. CONGRATULATIONS to the 24,032 athletes accepted into the 2016 race!